The Town of Cicero, a northern suburb of the City of Syracuse, is located in the northeast corner of Onondaga County and includes the eastern half of the Village of North Syracuse. According to the United States Census Bureau, the town has a total area of 48.5 square miles. The north town line of Cicero, marked by the Oneida River, is the border of Oswego County. The east town line is the border of Madison County, marked by the Chittenango Creek. The population was 31,632 at the 2010 census. At the Northern border of Cicero is Oneida Lake, one of the largest bodies of water located within New York State. Also within Cicero is a fairly large swamp named Cicero Swamp. U.S. Route 11, Interstate 81, Interstate 481, and New York State Route 31 pass through Cicero. New York State Route 298 intersects NY-31 near the east town line. The reconstructed Erie Canal follows the Oneida River along the north town line. The North Syracuse Central School District serves the Town of Cicero as well as the communities of Nort h Syracuse, Clay, Bridgeport, and Mattydale/Hinsdale. 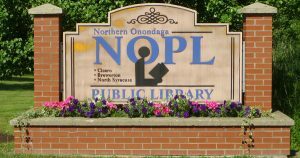 The Northern Onondaga Public Library (NOPL) serves residents with a Cicero library branch, located at 8686 Knowledge Lane. NOPL @ Cicero Library card holders have access to the entire Onondaga County Public Library catalog, as well as special NOPL-owned digital resources. NOPL @ Cicero Library is home to the remarkable LibraryFarm community garden.